In my post, https://silverpaintedriver.com/2016/01/31/the-lady-in-blue/, of 2 days ago, I included the image below. The post outlines the reasons why the Virgin Mary is predominately clothed in blue in Christian art, and this gorgeous painting illustrated my point beautifully. The REST ON THE FLIGHT INTO EGYPT is a set piece in Christian art. Following THE NATIVITY, Joseph receives information that the life of his newborn son is under threat. King Herod, the Roman-appointed King of the Jews, has heard that there is a new King of the Jews, namely Jesus. In an attempt to defend his throne against this perceived rival, Herod takes immediate and violent action and orders the massacre of all male infants of 2 years and under in Bethlehem. (This is also a set piece in Christian art, and a very powerful one – THE MASSACRE OF THE INNOCENTS.) To avoid the infanticide Joseph and his family flee to Egypt. 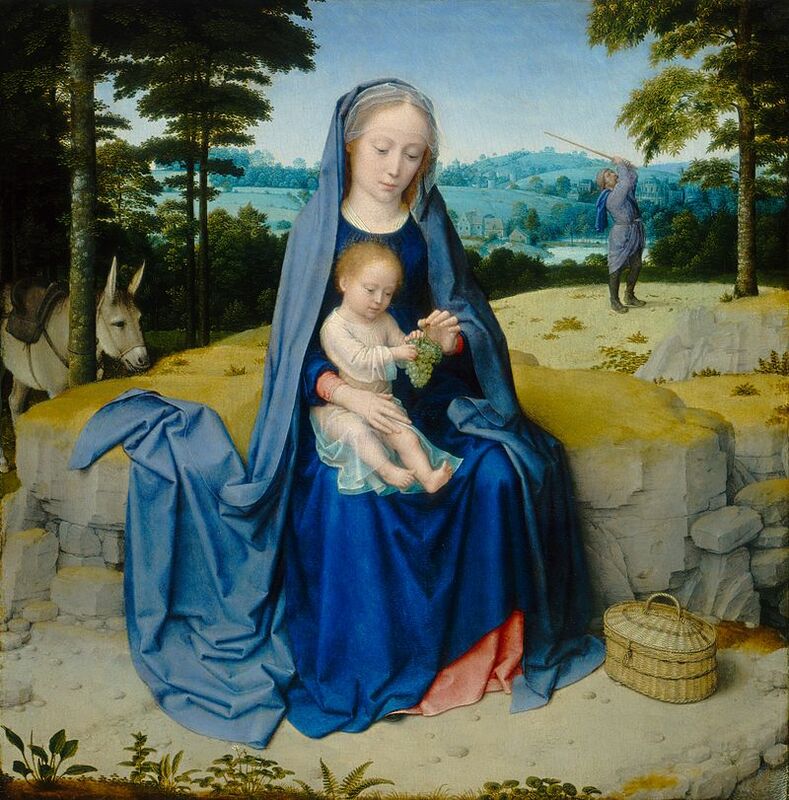 In responses to the post, the delicate rendition of the scene by Gerard David was much admired, but there were questions as to what exactly Joseph was up to in the background(!). I had always thought Joseph was getting in a bit of golf, already a popular sport in those days, but I defer to the wisdom of the National Gallery of Art in Washington. This painting looked very good in your previous blog but thanks for enlarging it. The blues are even more wonderful and as you say the turquoise landscape and the hazy sky are something else. Thanks, Francesca. Aha! He obviously didn’t notice that all the other trees were exactly the same. But it’s just as well Mary packed some grapes in her sewing basket to keep Jesus happy in the meantime… I love the often-hilarious geographical blending in Renaissance painting. Keeping it normal and comprehensible for the audience makes it almost more of a pleasure to look at. And you’re right, that turquoise is lovely. Reminds me of the backdrops they often used in early photographic portraiture. Yes, that sounds more likely than fly fishing. I love the idea of the tree lowering its branches – very convenient! He looks like he’s doing a martial art! Yes that turquoise landscape is divine. That is interesting about the Angel. Traditionally it is far more likely to be Joseph. In terms of protection, I suppose it would be the continuing threat from Herod.